The Black-necked Weaver Ploceus nigricollis is similar to the Spectacled Weaver P. ocularis, having a golden head with a narrow black mask through the eye, and a black bib in the male. Birds from Cameroon to Kenya are easily distinguished from the Spectacled Weaver by black upperparts, wings and tail in both sexes; theÂ�female and juvenile have a diagnostic yellow line between the black crown and mask. Birds in West Africa have green upperparts and differ from Spectacled Weavers in having a green (not yellow) crown, theÂ�male has a heavy chestnut wash around the black part, and the female has aÂ� yellow line between the crown and mask and a brown eye. The Black-necked Weaver is found from West to eastern Africa. Three subspecies are recognised (see map left, based on Birds of Africa): P. n. nigricollis, black-backed, in central Africa (see red on map). P. n. brachypterus, green-backed, in West Africa, including Bioko Island (see green on map). Birds from Bioko may be an additional race (po) having a longer and heavier bill, but further study is needed. P. n. melanoxanthus, black-backed, in East Africa (see blue on map). 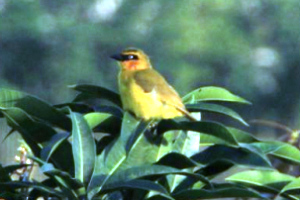 The male resembles the nominate subspecies but the forehead and crown are golden yellow. 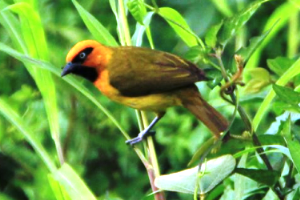 The Black-necked Weaver inhabits woodland, ranging from savanna to gallery forest, forest clearings and edges, gardens, oil palm, cocoa and coffee plantations, and mangroves, and occasionally in eucalypt plantations. Pairs remain together all year. It is not usually gregarious but small groups may forage together during the dry season, and may roost in groups. The Black-necked Weaver is mainly insectivorous, feeding on grasshoppers, caterpillars, beetles, ants, bugs, termite and ant alates. It also feeds on seeds, spiders, berries, fruit and nectar. In one study in Ivory Coast, diet was estimated as 60% arthropods, 20% fruit and 10% seeds. It sometimes joins mixed-species flocks of insectivores around clearings, gleaning the vegetation for insects. It usually feeds within 2 m of the ground, but may feed in the canopy. The Black-necked Weaver is solitary and monogamous, probably having a permanent pair bond, but polygyny has been recorded. The male defends the immediate vicinity of the nest. There are usually solitary nests or, where several nests are together, only one is occupied. One colony had 30 pairs in oil palm near Libreville, Gabon. The nest is retort-shaped with the entrance tunnel short or up to 20 cm long but narrower than the tunnel of the Spectacled Weaver. The nest is woven of grass, or in more forested areas, vine stems or tendrils of creepers. It is not tightly woven and often unlined, so that the eggs are visible from outside, but nests are usually well hidden (in contrast to the more exposed nests of Spectacled Weavers). The nest is usually built in the centre of thick trees but in Uganda may be attached to elephant grass. On Bioko nests in coconut palms are built near wasp nests. 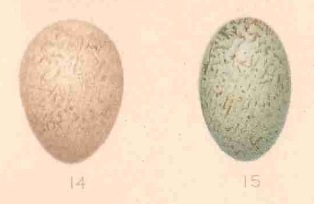 Two eggs are laid, and they are blue to whitish, with fine red speckles. The Black-necked Weaver has 1 PHOWN record (see PHOWN summary) and many are needed. Also look out for old nests which may be used for breeding by Dusky-blue Flycatchers Muscicapa comitata and occasionally by Bronze Mannikins Spermestes cucullata. Submit any weaver nest records to PHOWN (PHOtos of Weaver Nests) via the Virtual Museum upload site.